SpaceX's Falcon 9 rocket and the DSCOVR space-weather satellite on the launch pad at Florida's Cape Canaveral Air Force Station. Launch is scheduled for the evening of Feb. 11, 2015. 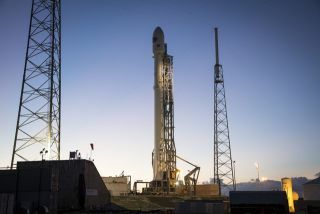 SpaceX has scaled back the daring rocket-landing test that it plans to perform after it launches a space weather satellite today (Feb. 11). The private spaceflight company had intended to try landing the first stage of its Falcon 9 rocket on an "autonomous spaceport drone ship" in the Atlantic Ocean during today's liftoff of the Deep Space Climate Observatory (DSCOVR), which is scheduled to take place at 6:03 p.m. EST (2303 GMT) from Florida's Cape Canaveral Air Force Station. You can watch the SpaceX launch live online, courtesy of NASA TV, beginning at 5 p.m. EST (2200 GMT). But rough seas have scuttled that plan. "The drone ship was designed to operate in all but the most extreme weather. We are experiencing just such weather in the Atlantic, with waves reaching up to three stories in height crashing over the decks," SpaceX representatives wrote in an update today. The drone ship, called "Just Read the Instructions," is named after a fictional sentient colony ship from the science fiction novels of author Iain M. Banks. "Also, only three of the drone ship's four engines are functioning, making station-keeping in the face of such wave action extremely difficult," SpaceX representatives wrote in the statement. "The rocket will still attempt a soft landing in the water through the storm (producing valuable landing data), but survival is highly unlikely." "Because DSCOVR is traveling to deep space, the moon's location on Feb. 12 through 19 would be close enough to DSCOVR to affect the spacecraft's trajectory," NASA officials wrote in a blog post today. "This would require performing mid-course correction burns that would use more fuel than what is planned for the mission. After today, the next launch opportunity would be on Friday, Feb. 20, at 5:43:44 p.m. EST." Weather forecasts predict a 90 percent chance of good conditions at the launch pad today, and more manageable high-altitude winds, they added. The $340 million DSCOVR mission, a joint project of the National Oceanic and Atmospheric Administration, NASA and the U.S. Air Force, is headed for the Earth-sun Lagrange Point 1, a gravitationally stable spot in space about 930,000 miles (1.5 million kilometers) from Earth. The spacecraft is designed to watch for strong solar storms that could affect power grids and satellite operations here on Earth. The DSCOVR project began in 1998 as Triana, an Earth-observing mission championed by then-Vice President Al Gore. It was mothballed in 2001, then resurrected as a space-weather effort in 2009. The rocket-flyback maneuver is part of SpaceX's effort to develop fully and rapidly reusuable rockets, a key priority of the company and its billionaire founder and CEO, Elon Musk. SpaceX has already succeeded in bringing a Falcon 9 first stage down for a soft ocean splashdown. Last month, the company tried the bold boat landing for the first time and nearly pulled it off: The rocket stage hit its target but came down too hard and exploded on the deck. Editor's Note: This story was updated at 2:45 p.m. EST to reflect SpaceX's decision not to pursue the drone ship landing with the Falcon 9 rocket stage.